Proprietary Name: Primaxin IV What is the Proprietary Name? Non-Proprietary Name: Imipenem And Cilastatin Sodium What is the Non-Proprietary Name? Primaxin IV with NDC 0006-3516 is a a human prescription drug product labeled by Merck Sharp & Dohme Corp.. The generic name of Primaxin IV is imipenem and cilastatin sodium. The product's dosage form is injection, powder, for solution and is administered via intravenous form. Dosage Form: Injection, Powder, For Solution - A sterile preparation intended for reconstitution to form a solution for parenteral use. FDA Application Number: NDA050587 What is the FDA Application Number? Start Marketing Date: 11-26-1985 What is the Start Marketing Date? Why is imipenem and cilastatin injection medication prescribed? 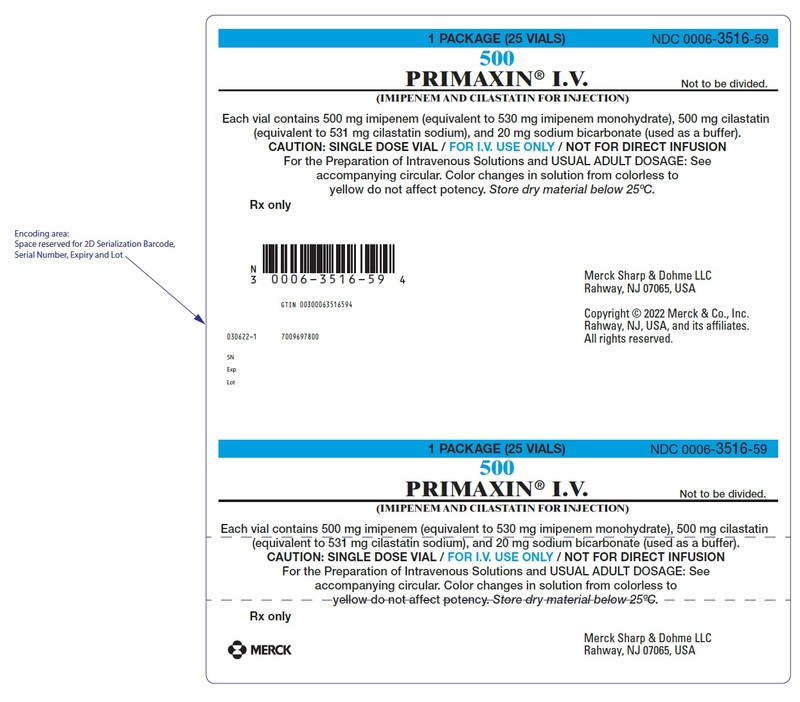 PRIMAXIN for intravenous use is indicated for the treatment of lower respiratory tract infections caused by susceptible strains of Staphylococcus aureus (penicillinase-producing isolates), Acinetobacter species, Enterobacter species, Escherichia coli, Haemophilus influenzae, Haemophilus parainfluenzae, Klebsiella species, Serratia marcescens. PRIMAXIN is indicated for the treatment of urinary tract infections (complicated and uncomplicated) caused by susceptible strains of Enterococcus faecalis, Staphylococcus aureus (penicillinase-producing isolates), Enterobacter species, Escherichia coli, Klebsiella species, Morganella morganii, Proteus vulgaris, Providencia rettgeri, Pseudomonas aeruginosa. PRIMAXIN is indicated for the treatment of intra-abdominal infections caused by susceptible strains of Enterococcus faecalis, Staphylococcus aureus (penicillinase-producing isolates), Staphylococcus epidermidis, Citrobacter species, Enterobacter species, Escherichia coli, Klebsiella species, Morganella morganii, Proteus species, Pseudomonas aeruginosa, Bifidobacterium species, Clostridium species, Eubacterium species, Peptococcus species, Peptostreptococcus species, Propionibacterium species, Bacteroides species including B. fragilis, Fusobacterium species. PRIMAXIN is indicated for the treatment of gynecologic infections caused by susceptible strains of Enterococcus faecalis, Staphylococcus aureus (penicillinase-producing isolates), Staphylococcus epidermidis, Streptococcus agalactiae (Group B streptococci), Enterobacter species, Escherichia coli, Gardnerella vaginalis, Klebsiella species, Proteus species, Bifidobacterium species, Peptococcus species, Peptostreptococcus species, Propionibacterium species, Bacteroides species including B. fragilis. PRIMAXIN is indicated for the treatment of bacterial septicemia caused by susceptible strains of Enterococcus faecalis, Staphylococcus aureus (penicillinase-producing isolates), Enterobacter species, Escherichia coli, Klebsiella species, Pseudomonas aeruginosa, Serratia species, Bacteroides species including B. fragilis. PRIMAXIN is indicated for the treatment of bone and joint infections caused by susceptible strains of Enterococcus faecalis, Staphylococcus aureus (penicillinase-producing isolates), Staphylococcus epidermidis, Enterobacter species, Pseudomonas aeruginosa. PRIMAXIN is indicated for the treatment of skin and skin structure infections caused by susceptible strains of Enterococcus faecalis, Staphylococcus aureus (penicillinase-producing isolates), Staphylococcus epidermidis, Acinetobacter species, Citrobacter species, Enterobacter species, Escherichia coli, Klebsiella species, Morganella morganii, Proteus vulgaris, Providencia rettgeri, Pseudomonas aeruginosa, Serratia species, Peptococcus species, Peptostreptococcus species, Bacteroides species including B. fragilis, Fusobacterium species. PRIMAXIN is indicated for the treatment of endocarditis caused by susceptible strains of Staphylococcus aureus (penicillinase-producing isolates). PRIMAXIN is not indicated in patients with meningitis because safety and efficacy have not been established.PRIMAXIN is not recommended in pediatric patients with CNS infections because of the risk of seizures [see Dosage and Administration (2.2), Warnings and Precautions (5.2), and Use in Specific Populations (8.4)].PRIMAXIN is not recommended in pediatric patients less than 30 kg with impaired renal function, as no data are available [see Use in Specific Populations (8.4), and Dosage and Administration (2.2)].Periodic assessment of organ system functions, including renal, hepatic and hematopoietic, is advisable during prolonged therapy. To reduce the development of drug-resistant bacteria and maintain the effectiveness of PRIMAXIN and other antibacterial drugs, PRIMAXIN should be used only to treat infections that are proven or strongly suspected to be caused by susceptible bacteria. When culture and susceptibility information are available, they should be considered in selecting or modifying antibacterial therapy. In the absence of such data, local epidemiology and susceptibility patterns may contribute to the empiric selection of therapy. Patients with creatinine clearance less than 90 mL/min require dosage reduction of PRIMAXIN as indicated in Table 3. The serum creatinine should represent a steady state of renal function. Use the Cockroft-Gault method described below to calculate the creatinine clearance:Males:(weight in kg) × (140-age in years) (72) × serum creatinine (mg/100 mL)Females:(0.85) × (value calculated for males)Table 3: Dosage of PRIMAXIN for Adult Patients in Various Renal Function Groups Based on Estimated Creatinine Clearance (CLcr) Creatinine clearance (mL/min) Greater than or equal to 90Less than 90 to greater than or equal to 60Less than 60 to greater than or equal to 30Less than 30 to greater than or equal to 15Dosage of PRIMAXINAdminister doses less than or equal to 500 mg by intravenous infusion over 20 to 30 minutes.,Administer doses greater than 500 mg by intravenous infusion over 40 to 60 minutes. In patients who develop nausea during the infusion, the rate of infusion may be slowedIf the infection is suspected or proven to be due to a susceptible bacterial species:500 mg every 6 hours400 mg every 6 hours300 mg every 6 hours200 mg every 6 hoursOR1000 mg every 8 hours500 mg every 6 hours500 mg every 8 hours500 mg every 12 hoursDosage of PRIMAXIN,If the infection is suspected or proven to be due to bacterial species with intermediate susceptibility (identified under column "I" in Table 10) [See Microbiology (12.4)]:1000 mg every 6 hours750 mg every 8 hours500 mg every 6 hours500 mg every 12 hoursIn patients with creatinine clearances of less than 30 to greater than or equal to 15 mL/min, there may be an increased risk of seizures [see Warnings and Precautions (5.2) and Use in Specific Populations (8.6)]. Patients with creatinine clearance less than 15 mL/min should not receive PRIMAXIN unless hemodialysis is instituted within 48 hours. There is inadequate information to recommend usage of PRIMAXIN for patients undergoing peritoneal dialysis. When treating patients with creatinine clearances of less than 15 mL/min who are undergoing hemodialysis, use the dosage recommendations for patients with creatinine clearances of less than 30 to greater than or equal to 15 mL/min in Table 3 above [see Dosage and Administration (2.3)]. Both imipenem and cilastatin are cleared from the circulation during hemodialysis. The patient should receive PRIMAXIN after hemodialysis and at intervals timed from the end of that hemodialysis session. Dialysis patients, especially those with background CNS disease, should be carefully monitored; for patients on hemodialysis, PRIMAXIN is recommended only when the benefit outweighs the potential risk of seizures. [See Warnings and Precautions (5.2)]. PRIMAXIN VialsDo not use diluents containing benzyl alcohol to reconstitute PRIMAXIN for administration to neonates because it has been associated with toxicity in neonates. While toxicity has not been demonstrated in pediatric patients greater than three months of age, small pediatric patients in this age range may also be at risk for benzyl alcohol toxicity.Contents of the vials must be reconstituted by adding approximately 10 mL of the appropriate diluent to the vial. List of appropriate diluents are as follows:0.9% Sodium Chloride Injection5% or 10% Dextrose Injection5% Dextrose and 0.9% Sodium Chloride Injection5% Dextrose Injection with 0.225% or 0.45% saline solution 5% Dextrose Injection with 0.15% potassium chloride solutionMannitol 5% and 10%Reconstituted Solutions of PRIMAXIN range from colorless to yellow. Variations of color within this range do not affect the potency of the product.The reconstituted suspension must not be administered by direct Intravenous InfusionAfter reconstitution, shake vial well and transfer the resulting suspension to 100 mL of an appropriate infusion solution before administering by intravenous infusion.Repeat transfer of the resulting suspension with an additional 10 mL of infusion solution to ensure complete transfer of vial contents to the infusion solution. Agitate the resulting mixture until clear.Parenteral drug products should be inspected visually for particulate matter and discoloration prior to administration, whenever solution and container permit. Vials (After Reconstitution)PRIMAXIN, as supplied in single dose vials and reconstituted with the appropriate diluents [see Dosage and Administration (2.5)], maintains satisfactory potency for 4 hours at room temperature or for 24 hours under refrigeration (5°C). Do not freeze solutions of PRIMAXIN. Adverse Laboratory ChangesThe following adverse laboratory changes were reported during clinical trials:Hepatic: Increased alanine aminotransferase (ALT or SGPT), aspartate aminotransferase (AST or SGOT), alkaline phosphatase, bilirubin, and lactate dehydrogenase (LDH)Hemic: Increased eosinophils, positive Coombs test, increased WBC, increased platelets, decreased hemoglobin and hematocrit, increased monocytes, abnormal prothrombin time, increased lymphocytes, increased basophilsElectrolytes: Decreased serum sodium, increased potassium, increased chlorideRenal: Increased BUN, creatinineUrinalysis: Presence of urine protein, urine red blood cells, urine white blood cells, urine casts, urine bilirubin, and urine urobilinogen. Adverse Laboratory ChangesThe following adverse laboratory changes were reported in studies of 178 pediatric patients 3 months of age: increased AST (SGOT), decreased hemoglobin/hematocrit, increased platelets, increased eosinophils, increased ALT (SGPT), increased urine protein, decreased neutrophils.The following adverse laboratory changes were reported in studies of 135 patients (neonates to 3 months of age): increased eosinophils, increased AST (SGPT), increased serum creatinine, increased/decreased platelet count, increased/decreased bilirubin, increased ALT (SGPT), increased alkaline phosphatase, increased/decreased hematocrit. Adverse Laboratory ChangesAdverse laboratory changes reported since the drug was marketed were:Hematologic: agranulocytosis.Examination of published literature and spontaneous adverse reactions reports suggested a similar spectrum of adverse reactions in adult and pediatric patients. Pregnancy Category C: There are no adequate and well-controlled studies of PRIMAXIN in pregnant women. PRIMAXIN should be used during pregnancy only if the potential benefit justifies the potential risk to the mother and fetus. Developmental toxicity studies with imipenem and cilastatin sodium (alone or in combination) administered to monkeys, rabbits, rats, and mice revealed no evidence of teratogenicity. Imipenem was administered intravenously to rabbits and rats at doses up to 60 and 900 mg/kg/day, respectively, up to approximately 0.4 and 2.9 time the maximum recommended human daily dose as a component of PRIMAXIN, based on body surface area. Cilastatin sodium was given intravenously to rabbits at doses up to 300 mg/kg/day and to rats subcutaneously at doses up to 1000 mg/kg/day, up to approximately 1.9 and 3.2 times the maximum recommended human daily dose as a component of PRIMAXIN, based on body surface area. Imipenem-cilastatin sodium was given intravenously at doses up to 80 mg/kg/day and subcutaneously at doses up to 320 mg/kg/day to mice and rats (the higher dose is approximately equal to the highest recommended human daily dose based on body surface area). Intravenous doses of imipenem-cilastatin sodium at approximately 100 mg/kg/day (0.6 times the maximum recommended human daily dose, based on body surface area) administered to pregnant cynomolgus monkeys at an infusion rate mimicking human clinical use were not associated with teratogenicity, but there was an increase in embryonic loss relative to controls. However, an imipenem-cilastatin dose of 40 mg/kg given to pregnant cynomolgus monkeys by bolus intravenous injection caused significant maternal toxicity including death and embryofetal loss.No adverse effects on the fetus or on lactation were observed when imipenem-cilastatin sodium was administered subcutaneously to rats late in gestation at dosages up to 320 mg/kg/day, approximately equal to the highest recommended human dose (based on body surface area). Although a slight decrease in live fetal body weight was observed at the high dose, there were no adverse effects on fetal viability, growth or postnatal development of pups. MetabolismImipenem, when administered alone, is metabolized in the kidneys by dehydropeptidase I, resulting in relatively low levels in urine. Cilastatin sodium, an inhibitor of this enzyme, effectively prevents renal metabolism of imipenem so that when imipenem and cilastatin sodium are given concomitantly, adequate antibacterial levels of imipenem are achieved in the urine. EliminationThe plasma half-life of each component is approximately 1 hour. Approximately 70% of the administered imipenem is recovered in the urine within 10 hours after which no further urinary excretion is detectable. Urine concentrations of imipenem in excess of 10 mcg/mL can be maintained for up to 8 hours with PRIMAXIN at the 500-mg dose. Approximately 70% of the cilastatin sodium dose is recovered in the urine within 10 hours of administration of PRIMAXIN. Imipenem-cilastatin sodium is hemodialyzable [see Overdosage (10)].No accumulation of imipenem/cilastatin in plasma or urine is observed with regimens administered as frequently as every 6 hours in patients with normal renal function. Geriatric PatientsIn healthy elderly volunteers (65 to 75 years of age with normal renal function for their age), the pharmacokinetics of a single dose of imipenem 500 mg and cilastatin 500 mg administered intravenously over 20 minutes are consistent with those expected in subjects with slight renal impairment for which no dosage alteration is considered necessary. The mean plasma half-lives of imipenem and cilastatin are 91 ± 7 minutes and 69 ± 15 minutes, respectively. Multiple dosing has no effect on the pharmacokinetics of either imipenem or cilastatin, and no accumulation of imipenem/cilastatin is observed. Pediatric PatientsDoses of 25 mg/kg/dose in patients 3 months to <3 years of age, and 15 mg/kg/dose in patients 3-12 years of age were associated with mean trough plasma concentrations of imipenem of 1.1±0.4 mcg/mL and 0.6±0.2 mcg/mL following multiple 60-minute infusions, respectively; trough urinary concentrations of imipenem were in excess of 10 mcg/mL for both doses. These doses have provided adequate plasma and urine concentrations for the treatment of non-CNS infections.In a dose-ranging study of smaller premature infants (670-1,890 g) in the first week of life, a dose of 20 mg/kg q12h by 15-30 minutes infusion was associated with mean peak and trough plasma imipenem concentrations of 43 mcg/mL and 1.7 mcg/mL after multiple doses, respectively. However, moderate accumulation of cilastatin in neonates may occur following multiple doses of PRIMAXIN. The safety of this accumulation is unknown. Mechanism of ActionPRIMAXIN is a combination of imipenem and cilastatin. The bactericidal activity of imipenem results from the inhibition of cell wall synthesis. Its greatest affinity is for penicillin binding proteins (PBPs) 1A, 1B, 2, 4, 5 and 6 of Escherichia coli, and 1A, 1B, 2, 4 and 5 of Pseudomonas aeruginosa. The lethal effect is related to binding to PBP 2 and PBP 1B.Imipenem has a high degree of stability in the presence of beta-lactamases, both penicillinases and cephalosporinases produced by Gram-negative and Gram-positive bacteria. It is a potent inhibitor of beta-lactamases from certain Gram-negative bacteria which are inherently resistant to most beta-lactam antibacterials, e.g., Pseudomonas aeruginosa, Serratia spp., and Enterobacter spp. ResistanceImipenem is inactive in vitro against Enterococcus faecium, Stenotrophomonas maltophilia and some isolates of Burkholderia cepacia. Methicillin-resistant staphylococci should be reported as resistant to imipenem. Interaction with Other AntimicrobialsIn vitro tests show imipenem to act synergistically with aminoglycoside antibacterials against some isolates of Pseudomonas aeruginosa. Antimicrobial ActivityImipenem has been shown to be active against most isolates of the following microorganisms, both in vitro and in clinical infections [see Indications and Usage (1.1)].Aerobic bacteriaGram-positive bacteria Enterococcus faecalis Staphylococcus aureus Staphylococcus epidermidis Streptococcus agalactiae (Group B streptococci) Streptococcus pneumoniae Streptococcus pyogenesGram-negative bacteria Acinetobacter spp. Citrobacter spp. Enterobacter spp. Escherichia coli Gardnerella vaginalis Haemophilus influenzae Haemophilus parainfluenzae Klebsiella spp. Morganella morganii Proteus vulgaris Providencia rettgeri Pseudomonas aeruginosa Serratia spp., including S. marcescensAnaerobic bacteriaGram positive bacteria Bifidobacterium spp. Clostridium spp. Eubacterium spp. Peptococcus spp. Peptostreptococcus spp. Propionibacterium spp.Gram-negative bacteria Bacteroides spp., including B. fragilis Fusobacterium spp.The following in vitro data are available, but their clinical significance is unknown. At least 90 percent of the following bacteria exhibit an in vitro minimum inhibitory concentration (MIC) less than or equal to the susceptible breakpoint for imipenem against isolates of similar genus or organism group. However, the efficacy of imipenem in treating clinical infections due to these bacteria has not been established in adequate and well-controlled clinical trials.Aerobic bacteriaGram-positive bacteria Bacillus spp. Listeria monocytogenes Nocardia spp. Staphylococcus saprophyticus Group C streptococci Group G streptococci Viridans group streptococciGram-negativebacteria Aeromonas hydrophila Alcaligenes spp. Capnocytophaga spp. Haemophilus ducreyi Neisseria gonorrhoeae Pasteurella spp. Providencia stuartiiAnaerobic bacteria Prevotella bivia Prevotella disiens Prevotella melaninogenica Veillonella spp. Susceptibility Test MethodsWhen available, the clinical microbiology laboratory should provide cumulative reports of in vitro susceptibility tests results for antimicrobial drugs used in local hospitals and practice areas to the physician as periodic reports that describe the susceptibility profile of nosocomial and community-acquired pathogens. These reports should aid the physician in selecting an antibacterial drug for treatment. Dilution Techniques:Quantitative methods are used to determine antimicrobial MICs. These MICs provide estimates of the susceptibility of bacteria to antimicrobial compounds. The MICs should be determined using a standardized test method (broth and/or agar).1,2 The MIC values should be interpreted according to breakpoints provided in Table 10. Diffusion Techniques:Quantitative methods that require measurement of zone diameters can also provide reproducible estimates of the susceptibility of bacteria to antimicrobial compounds. The zone size should be determined using a standardized test method.2,3 This procedure uses paper disks impregnated with 10-mcg of imipenem to test the susceptibility of bacteria to imipenem. The disk diffusion breakpoints are provided in Table 10. Anaerobic Techniques:For anaerobic bacteria, the susceptibility to imipenem can be determined by a standardized test method.4 The MIC values obtained should be interpreted according to the breakpoints provided in Table 10.Table 10: Susceptibility Test Interpretive Criteria for ImipenemInterpretive criteria are based on a dosing regimen of 500 mg every 6 hours or 1000 mg every 8 hours.Minimum Inhibitory ConcentrationsMIC (mcg/mL)Disk Diffusion(zone diameters in mm)PathogenSIRSIRSusceptibility of staphylococci to imipenem may be deduced from testing penicillin and either cefoxitin or oxacillin.2Enterobacteriaceae≤12Use 1000 mg every 6 hours for bacteria with intermediate susceptibility in patients with creatinine clearance greater than or equal to 90 mL/min.≥4≥2320-22≤19Pseudomonas aeruginosa≤24≥8≥1916-18≤15Acinetobacter spp.≤24≥8≥2219-21≤18Haemophilus influenza and H. parainfluenzaeThe current absence of data on resistant isolates precludes defining any category other than 'Susceptible'. If isolates yield MIC results other than susceptible, they should be submitted to a reference laboratory for additional testing.≤4--≥16--Streptococcus pneumoniaeFor non-meningitis S. pneumoniae isolates, penicillin MICs ≤0.06 mcg/mL (or oxacillin zones ≥20 mm) indicate susceptibility to imipenem.≤0.120.25-0.5≥1---Anaerobes≤48≥16---A report of "Susceptible" (S) indicates that the antimicrobial drug is likely to inhibit growth of the pathogen if the antimicrobial drug reaches the concentration usually achievable at the site of infection. A report of "Intermediate" (I) indicates that the result should be considered equivocal, and, if the microorganism is not fully susceptible to alternative clinically feasible drugs, the test should be repeated. This category implies possible clinical applicability in body sites where the drug is physiologically concentrated or in situations where a high dosage of the drug can be used. This category also provides a buffer zone that prevents small uncontrolled technical factors from causing major discrepancies in interpretation. A report of "Resistant" (R) indicates that the antimicrobial drug is not likely to inhibit growth of the pathogen if the antimicrobial drug reaches the concentrations usually achievable at the infection site; other therapy should be selected. Before Reconstitution:The dry powder should be stored at a temperature below 25°C (77°F). Do not mix PRIMAXIN with, or physically add to, other antibacterial drugsPRIMAXIN may be administered concomitantly with other antibacterial drugs, such as aminoglycosides. PRIMAXIN is contraindicated in patients who have shown hypersensitivity to any component of this product. Serious and occasionally fatal hypersensitivity (anaphylactic) reactions have been reported in patients receiving therapy with beta-lactams. These reactions are more likely to occur in individuals with a history of sensitivity to multiple allergens. There have been reports of individuals with a history of penicillin hypersensitivity who have experienced severe hypersensitivity reactions when treated with another beta-lactam. Before initiating therapy with PRIMAXIN, careful inquiry should be made concerning previous hypersensitivity reactions to penicillins, cephalosporins, other beta-lactams and other allergens. If an allergic reaction to PRIMAXIN occurs, discontinue the drug immediately. Serious anaphylactic reactions require immediate emergency treatment as clinically indicated. Seizures and other CNS adverse experiences, such as confusional states and myoclonic activity, have been reported during treatment with PRIMAXIN, especially when recommended dosages were exceeded [see Adverse Reactions (6.1, 6.2)]. These experiences have occurred most commonly in patients with CNS disorders (e.g., brain lesions or history of seizures) and/or compromised renal function [see Use in Specific Populations (8.6)]. However, there have been reports of CNS adverse experiences in patients who had no recognized or documented underlying CNS disorder or compromised renal function.Anticonvulsant therapy should be continued in patients with known seizure disorders. If focal tremors, myoclonus, or seizures occur, patients should be evaluated neurologically, placed on anticonvulsant therapy if not already instituted, and the dosage of PRIMAXIN re-examined to determine whether it should be decreased or the antibacterial drug discontinued. Case reports in the literature have shown that co-administration of carbapenems, including PRIMAXIN, to patients receiving valproic acid or divalproex sodium results in a reduction in valproic acid concentrations. The valproic acid concentrations may drop below the therapeutic range as a result of this interaction, therefore increasing the risk of breakthrough seizures. Increasing the dose of valproic acid or divalproex sodium may not be sufficient to overcome this interaction. The concomitant use of PRIMAXIN and valproic acid/divalproex sodium is generally not recommended. Antibacterials other than carbapenems should be considered to treat infections in patients whose seizures are well controlled on valproic acid or divalproex sodium. If administration of PRIMAXIN is necessary, supplemental anti-convulsant therapy should be considered [see Drug Interactions (7.3)]. Close adherence to the recommended dosage and dosage schedules is urged, especially in patients with known factors that predispose to convulsive activity. Clostridium difficile associated diarrhea (CDAD) has been reported with use of nearly all antibacterial agents, including PRIMAXIN, and may range in severity from mild diarrhea to fatal colitis. Treatment with antibacterial agents alters the normal flora of the colon leading to overgrowth of C. difficile.C. difficile produces toxins A and B which contribute to the development of CDAD.Hypertoxin producing strains of C. difficile cause increased morbidity and mortality, as these infections can be refractory to antimicrobial therapy and may require colectomy. CDAD must be considered in all patients who present with diarrhea following antibacterial drug use. Careful medical history is necessary since CDAD has been reported to occur over two months after the administration of antibacterial agents.If CDAD is suspected or confirmed, ongoing antibacterial drug use not directed against C. difficile may need to be discontinued. Appropriate fluid and electrolyte management, protein supplementation, antibacterial drug treatment of C. difficile, and surgical evaluation should be instituted as clinically indicated. As with other antibacterial drugs, prolonged use of PRIMAXIN may result in overgrowth of nonsusceptible organisms. Repeated evaluation of the patient's condition is essential. If superinfection occurs during therapy, appropriate measures should be taken.Prescribing PRIMAXIN in the absence of a proven or strongly suspected bacterial infection or a prophylactic indication is unlikely to provide benefit to the patient and increases the risk of the development of drug-resistant bacteria. Generalized seizures have been reported in patients who received ganciclovir and PRIMAXIN. These drugs should not be used concomitantly with PRIMAXIN unless the potential benefits outweigh the risks. Concomitant administration of PRIMAXIN and probenecid results in increases in the plasma level and half-life of imipenem. Therefore, it is not recommended that probenecid be given concomitantly with PRIMAXIN. Case reports in the literature have shown that co-administration of carbapenems, including PRIMAXIN, to patients receiving valproic acid or divalproex sodium results in a reduction in valproic acid concentrations. The valproic acid concentrations may drop below the therapeutic range as a result of this interaction, therefore increasing the risk of breakthrough seizures. Although the mechanism of this interaction is unknown, data from in vitro and animal studies suggest that carbapenems may inhibit the hydrolysis of valproic acid's glucuronide metabolite (VPA-g) back to valproic acid, thus decreasing the serum concentrations of valproic acid [see Warnings and Precautions (5.3)]. The concomitant use of PRIMAXIN and valproic acid/divalproex sodium is generally not recommended. Antibacterials other than carbapenems should be considered to treat infections in patients whose seizures are well-controlled on valproic acid or divalproex sodium. It is not known whether imipenem-cilastatin sodium is excreted in human milk. Because many drugs are excreted in human milk, caution should be exercised when PRIMAXIN is administered to a nursing woman. Use of PRIMAXIN in pediatric patients is supported by evidence from adequate and well-controlled trials of PRIMAXIN in adults and clinical studies in pediatric patients [see Dosage and Administration (2.2) and Clinical Pharmacology (12.3)]. PRIMAXIN is not recommended in pediatric patients with CNS infections because of the risk of seizures.PRIMAXIN is not recommended in pediatric patients less than 30 kg with renal impairment, as no data are available. Of the approximately 3600 subjects ≥18 years of age in clinical studies of PRIMAXIN, including postmarketing studies, approximately 2800 received PRIMAXIN. Of the subjects who received PRIMAXIN, data are available on approximately 800 subjects who were 65 and over, including approximately 300 subjects who were 75 and over. No overall differences in safety or effectiveness were observed between these subjects and younger subjects. Other reported clinical experience has not identified differences in responses between the elderly and younger patients, but greater sensitivity of some older individuals cannot be ruled out.This drug is known to be substantially excreted by the kidney, and the risk of toxic reactions to this drug may be greater in patients with impaired renal function. Because elderly patients are more likely to have decreased renal function, care should be taken in dose selection, and it may be useful to monitor renal function.No dosage adjustment is required based on age [see Clinical Pharmacology (12.3)]. Dosage adjustment in the case of renal impairment is necessary [see Dosage and Administration (2.3)]. Dosage adjustment is necessary in patients with renal impairment [see Dosage and Administration (2.3)]. Adult patients with creatinine clearances of less than or equal to 30 mL/min, whether or not undergoing hemodialysis, had a higher risk of seizure activity than those without impairment of renal function [see Warnings and Precautions (5.2)]. Therefore, close adherence to the dosing guidelines and regular monitoring of creatinine clearance for these patients is recommended. In the case of overdosage, discontinue PRIMAXIN, treat symptomatically, and institute supportive measures as required. PRIMAXIN is hemodialyzable. PRIMAXIN (imipenem and cilastatin) for Injection is a sterile formulation of imipenem, a penem antibacterial, and cilastatin, a renal dehydropeptidase inhibitor with sodium bicarbonate added as a buffer. PRIMAXIN is an antibacterial drug for intravenous administration.Imipenem (N-formimidoylthienamycin monohydrate) is a crystalline derivative of thienamycin, which is produced by Streptomyces cattleya. Its chemical name is (5R,6S)-3-[[2-(formimidoylamino)ethyl]thio]-6-[(R)-1-hydroxyethyl]-7-oxo-1-azabicyclo[3.2.0]hept-2-ene-2-carboxylic acid monohydrate. It is an off-white, nonhygroscopic crystalline compound with a molecular weight of 317.37. It is sparingly soluble in water and slightly soluble in methanol. Its empirical formula is C12H17N3O4S∙H2O, and its structural formula is:Cilastatin sodium is the sodium salt of a derivatized heptenoic acid. Its chemical name is sodium (Z)-7[[(R)-2-amino-2-carboxyethyl]thio]-2-[(S)-2,2-dimethylcyclopropanecarboxamido]-2-heptenoate. It is an off-white to yellowish-white, hygroscopic, amorphous compound with a molecular weight of 380.43. It is very soluble in water and in methanol. Its empirical formula is C16H25N2O5SNa, and its structural formula is:PRIMAXIN is buffered to provide solutions in the pH range of 6.5 to 8.5. There is no significant change in pH when solutions are prepared and used as directed. [See How Supplied/ Storage and Handling (16.1).] PRIMAXIN 500 contains 37.5 mg of sodium (1.6 mEq). Solutions of PRIMAXIN range from colorless to yellow. Variations of color within this range do not affect the potency of the product. PRIMAXIN is a combination of imipenem and cilastatin. Imipenem is a penem antibacterial drug [see Microbiology (12.4)]. Cilastatin sodium is a renal dehydropeptidase inhibitor that limits the renal metabolism of imipenem. Intravenous infusion of PRIMAXIN over 20 minutes results in peak plasma levels of imipenem antimicrobial activity that range from 21 to 58 mcg/mL for the 500 mg dose, and from 41 to 83 mcg/mL for the 1000 mg dose. At these doses, plasma levels of imipenem antimicrobial activity decline to below 1 mcg/mL or less in 4 to 6 hours. Peak plasma levels of cilastatin following a 20-minute intravenous infusion of PRIMAXIN range from 31 to 49 mcg/mL for the 500 mg dose, and from 56 to 88 mcg/mL for the 1000 mg dose. Long term studies in animals have not been performed to evaluate carcinogenic potential of imipenem-cilastatin. A variety of bacterial and mammalian tests were performed to evaluate genetic toxicity. The tests used were: V79 mammalian cell mutagenesis assay (cilastatin sodium alone and imipenem alone), Ames test (cilastatin sodium alone and imipenem alone), unscheduled DNA synthesis assay (imipenem-cilastatin sodium) and in vivo mouse cytogenetics test (imipenem-cilastatin sodium). None of these tests showed any evidence of genetic alterations.Impairment of fertility or reproductive performance was not observed in male and female rats given imipenem-cilastatin at intravenous doses up to 80 mg/kg/day and at a subcutaneous dose of 320 mg/kg/day. In rats, a dose of 320 mg/kg/day was approximately equal to the highest recommended human dose based on body surface area. Clinical and Laboratory Standards Institute (CLSI). Methods for Dilution Antimicrobial Susceptibility Tests for Bacteria that Grow Aerobically; Approved Standard - Tenth Edition. CLSI document M07-A10, Clinical and Laboratory Standards Institute, 950 West Valley Road, Suite 2500, Wayne, Pennsylvania 19087, USA, 2015.Clinical and Laboratory Standards Institute (CLSI). Performance Standards for Antimicrobial Susceptibility Testing; Twenty-sixth Informational Supplement, CLSI document M100-S26, Clinical and Laboratory Standards Institute, 950 West Valley Road, Suite 2500, Wayne, Pennsylvania 19087, USA, 2016.Clinical and Laboratory Standards Institute (CLSI). Performance Standards for Antimicrobial Disk Diffusion Susceptibility Tests; Approved Standard – Twelfth Edition. CLSI document M02-A12, Clinical and Laboratory Standards Institute, 950 West Valley Road, Suite 2500, Wayne, Pennsylvania 19087, USA, 2015.Clinical and Laboratory Standards Institute (CLSI). Methods for Antimicrobial Susceptibility Testing of Anaerobic Bacteria; Approved Standard – Eighth Edition. CLSI document M11-A8 Clinical and Laboratory Standards Institute, 950 West Valley Road, Suite 2500, Wayne, Pennsylvania 19087, USA 2012. Advise the patient to read the FDA-approved patient labeling (Instructions for Use).Advise patients that allergic reactions, including serious allergic reactions, could occur and that serious reactions require immediate treatment. They should report any previous hypersensitivity reactions to PRIMAXIN, other carbapenems, beta-lactams or other allergens.Counsel patients that antibacterial drugs including PRIMAXIN should only be used to treat bacterial infections. They do not treat viral infections (e.g., the common cold). When PRIMAXIN is prescribed to treat a bacterial infection, patients should be told that although it is common to feel better early in the course of therapy, the medication should be taken exactly as directed. Skipping doses or not completing the full course of therapy may (1) decrease the effectiveness of the immediate treatment and (2) increase the likelihood that bacteria will develop resistance and will not be treatable by PRIMAXIN or other antibacterial drugs in the future.Counsel patients to inform their physician:if they have central nervous system disorders such as stroke or history of seizures. Seizures have been reported during treatment with PRIMAXIN and with closely related antibacterial drugs.if they are taking valproic acid or sodium valproate. Valproic acid concentrations in the blood may drop below the therapeutic range upon co-administration with PRIMAXIN. If treatment with PRIMAXIN is necessary and continued, alternative or supplemental anti-convulsant medication to prevent and/or treat seizures may be needed.Advise patients that diarrhea is a common problem caused by antibacterial drugs and usually resolves when the drug is discontinued. Sometimes, frequent watery or bloody diarrhea may occur and may be a sign of a more serious intestinal infection. If severe watery or bloody diarrhea develops, patients should contact their healthcare provider.